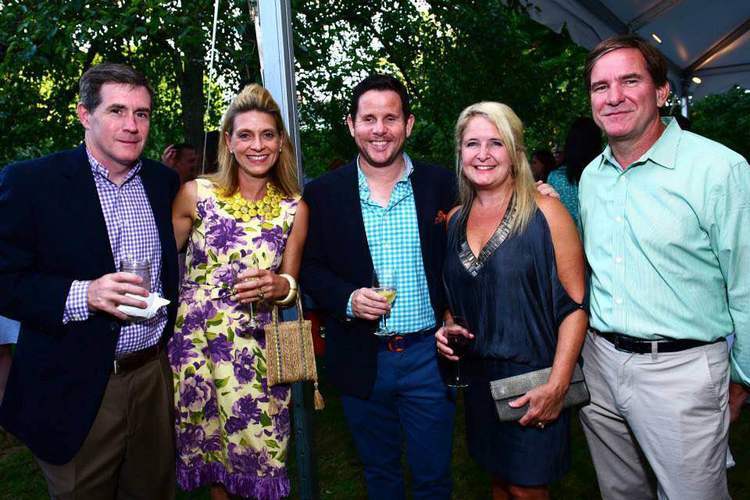 For those of us in the Northeast, it’s a summer tradition to head to the Hampton Designer Showhouse sponsored by Traditional Home in August, which benefits the Southampton Hospital. Just outside the village of Sag Harbor, the house lends itself to a vacation home vibe with the urban sophistication that New Yorkers bring to The Hamptons. 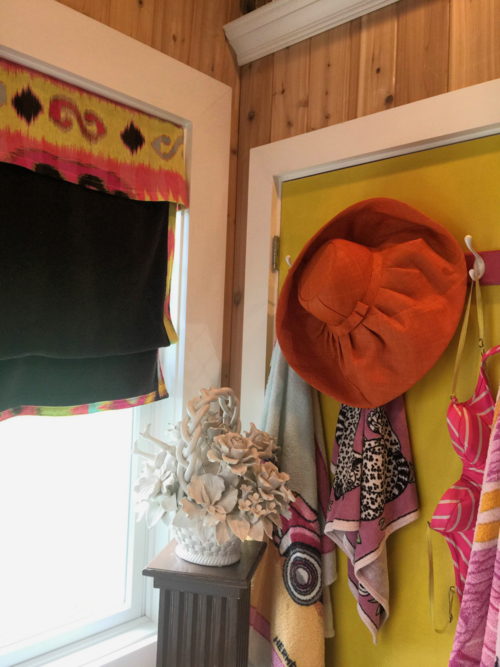 Lots of fabulous photos have been flying around social media which give a glimpse into the showhouse, but I’d like to add my magpie “trends & trimspotting” view to the mix of the Hampton Designer Showhouse 2015. Here are some specific highlights although I applaud each designer for sharing their talent and time for this philanthropic endeavor. Marlaina Teich’s personality is as vibrant as her kitchen design. She’s colorful and likes a little bling. Focused on embellishments, I was drawn to the sparkle in her choice of materials she brought in to introduce a watery theme. 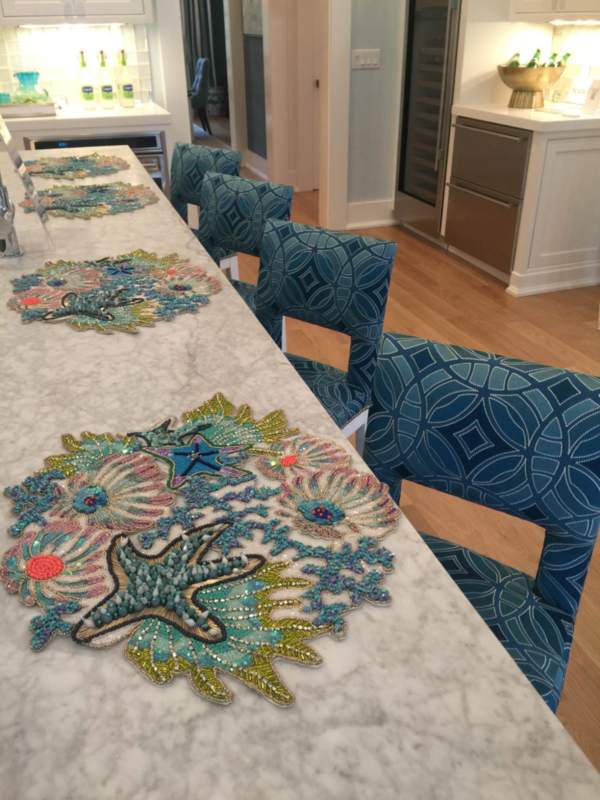 Kim Seybert’s beaded “Sea Odyssey” placements set the tone for the upbeat blues that vibrated against the classic Carrera marble. Barstools are upholstered in gorgeous mosaic style pattern called Perspective by Beacon Hill. For the windows, the lucite drapery hardware reflected light onto the masterfully cut-out valences, no small feat for even the best of workrooms, bravo Marks and Tavano. The hanging wood tassels and white cording pulled all the elements of this kitchen together — soft and hard, a stroke of design acumen. 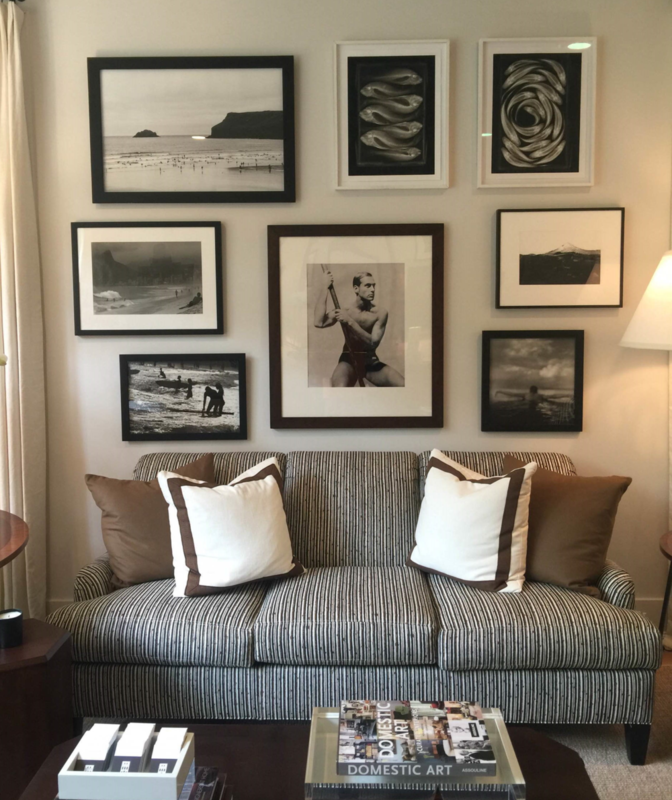 When I met the dashing Robert Brown and introduced myself, he chuckled “I don’t really do trim.” So it was my turn to giggle when I visited his library and first noticed the tailored tape on his sofa pillows. Robert of course used it in just the right dose for his modern, classically tailored aesthetic. I look forward to visiting Townhouse, his retail/gallery space, when I am in Atlanta later this month, I want to see more, more, more. 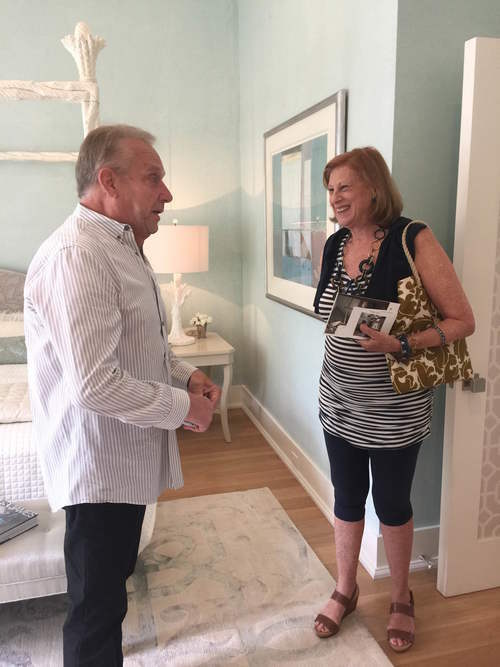 Richard Mortimer of Hagins & Mortimer Design guided me through the serene bedroom they designed, pointing out all the details. The beautiful window treatment caught my eye. 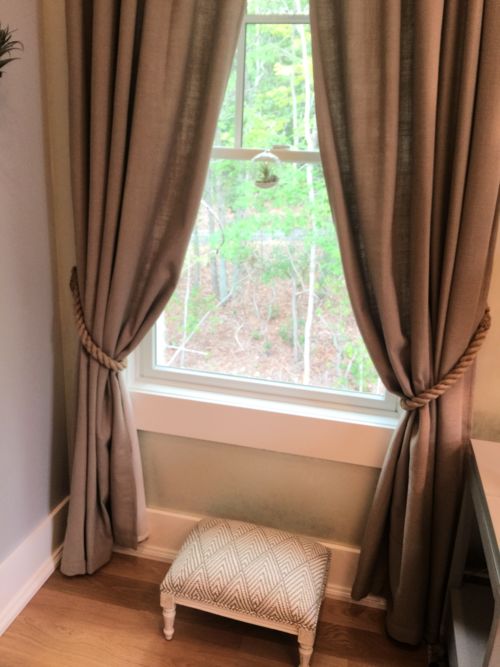 He explained they softened the square shape of the window with the curvaceous drapes edged with a serpentine braid. 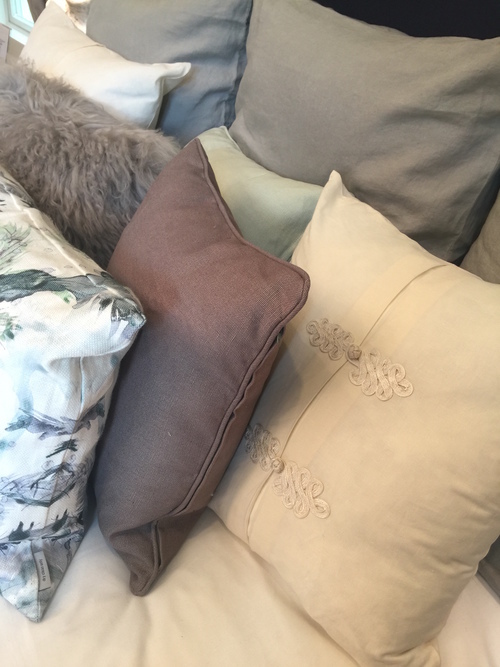 Tonal brush fringe and feathers embellished the pillows on the bed adding form, texture, softness and glamor. 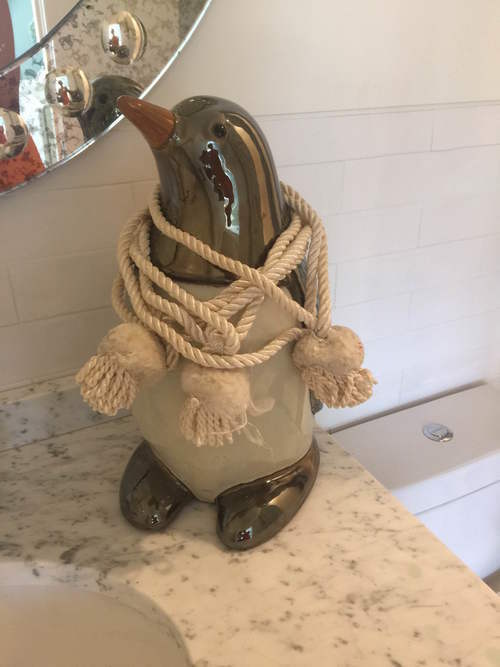 They even added tassels for a little whimsy in the bath. 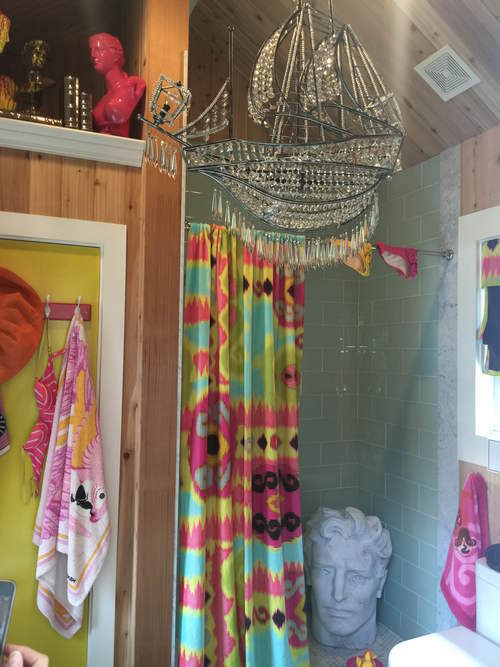 Tasseliscious whimsy in the bath! Bedroom II by Elise Som Design Studio was a space that brought outdoor elements inside — the woods, the flora, the seaside. Succulents framed the bed and hung from the walls, natural burlap lampshades and jute tiebacks complemented the watery blues and greens. Jute rope tiebacks read both natural and nautical. The frog closures peeking out in the pillow mix was a sophisticated design detail. 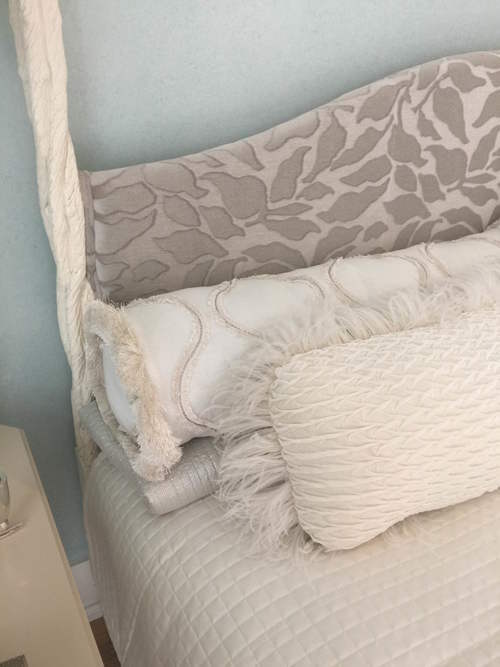 For a peek at how this room came together, check out Elise’s time lapse video >> click HERE. 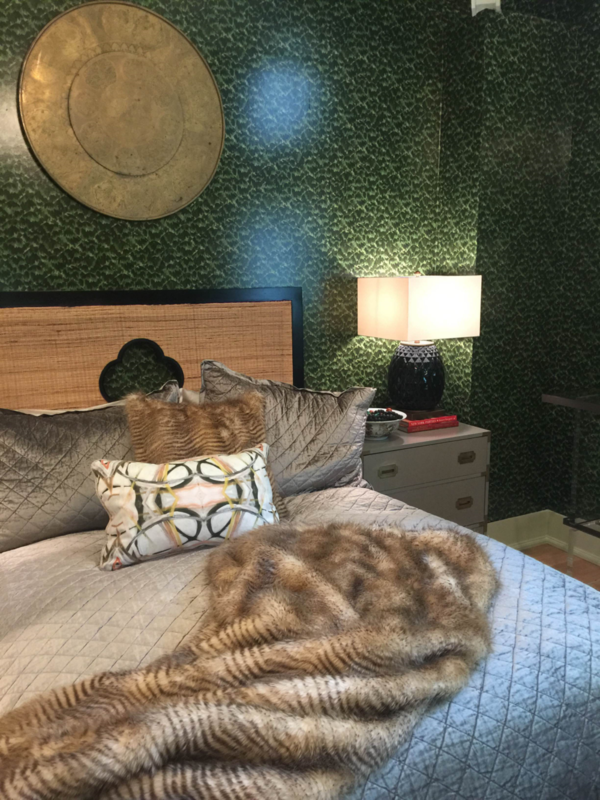 In a totally different design vein, Dallas based designer Denise McGaha envisioned for this luxurious bedroom “a client very much in the spotlight, but intensely private.” The tortoise wallpaper, Celerie Kemble’s for Schumacher, proved the perfect backdrop for the dramatic lifestyle of Denise’s muse. Her mix of textures and finishes, brass, fur, velvet, linen, grasscloth, matte, shiny, in warm colors warm peppering black, was masterful and opulent. This was my favorite gallery wall in the house, collected and eclectic with collected works from Kelly O’Neal and Linda Burnside. 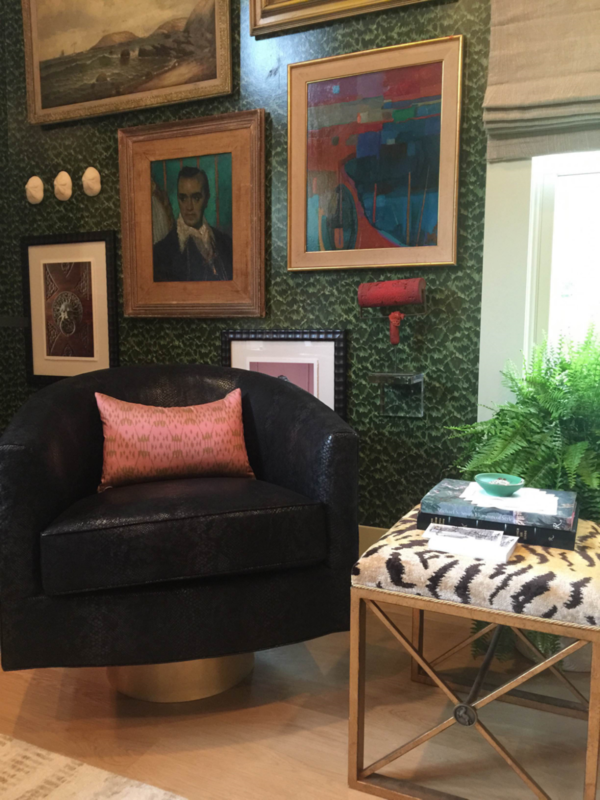 The Kelly Wearstler Serpent fabric by Lee Jofa on the Taylor Burke Home Hollings Chair adds to the allure of the room. 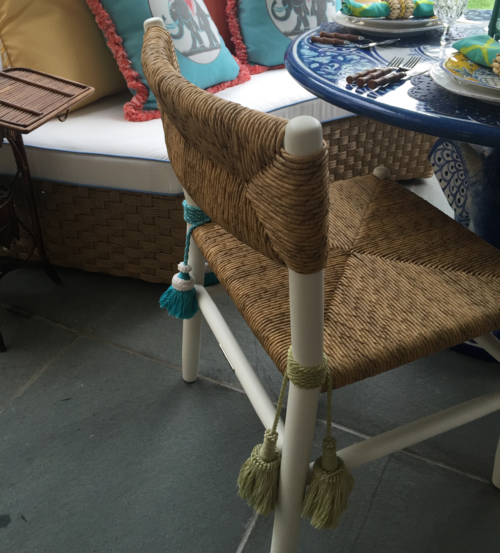 I trimspotted the cording on the upholstered tiger benches by Gracious Home , which added some softness to the strong lines. 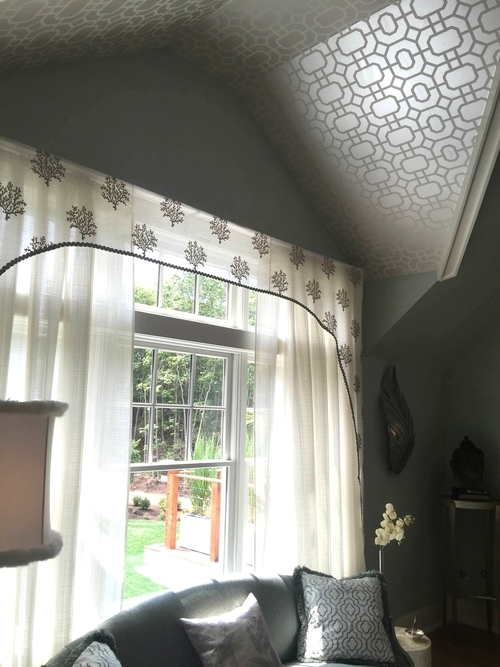 Denise used many Kelly Wearstler fabrics and added this graphic tape for Lee Jofa, on the roman shade in the bathroom for a bohemian touch. This shot is from her blog post detailing her process of pulling it all together, with help from her design network of friends. Read how she masterminded her room >> here. 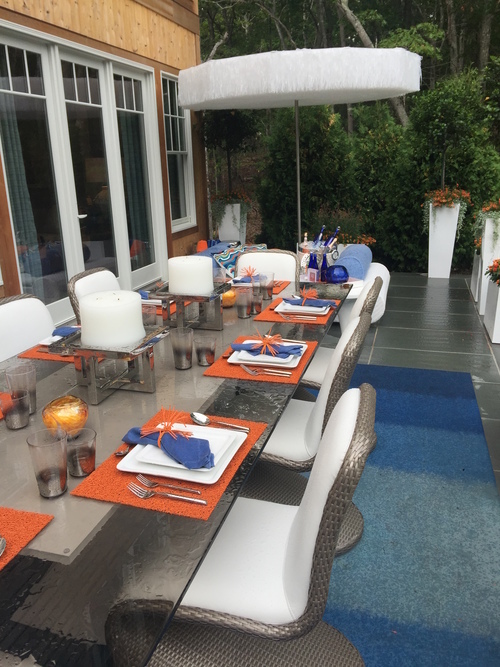 Heading outside, Katharine Posillico for Katharine Jessica Interior Design styled a party-perfect patio. With a graphic mix of summer orange, white and blues inspired by the glamorous Mediterranean Riviera scene in the 70’s. 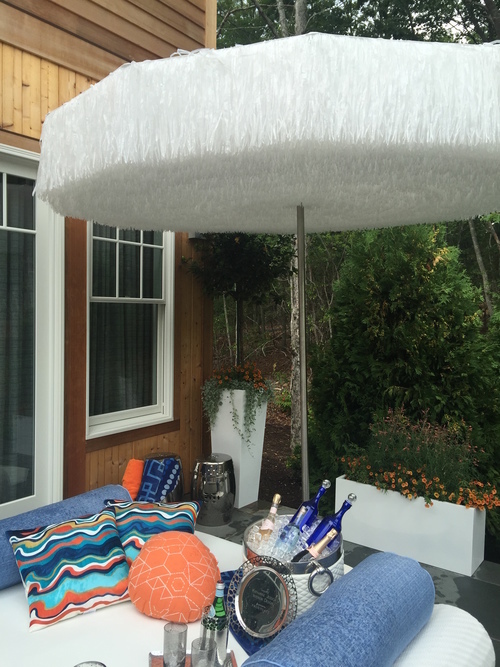 The raffia “Frou Frou Parasol” by Porta Forma was notable, setting the stage with high-end style, and indeed one could image a sunkissed Brigitte Bardot sipping a cocktail beneath these fronds. In their typical chic-patternplay style, Jason Nixon and John Loecke of Madcap Cottage designed the covered porch with lush detail that invited lingering to drink in all the detail. 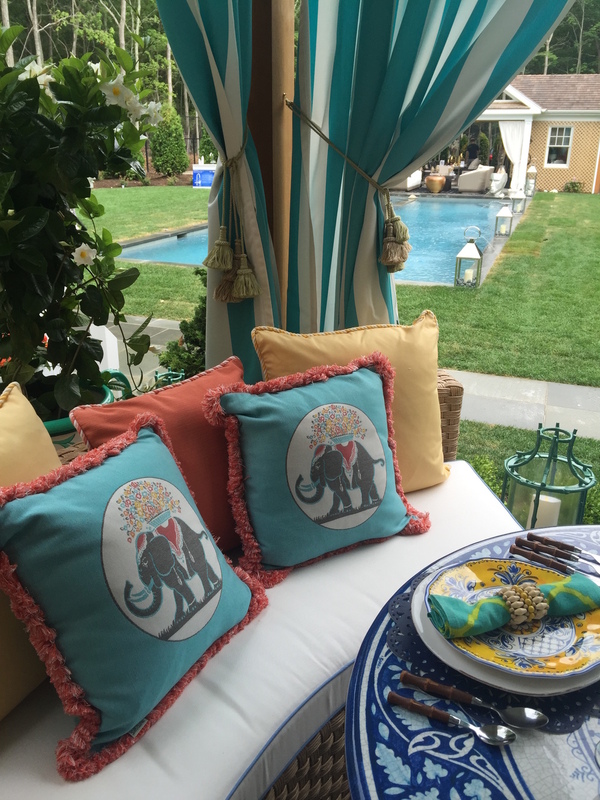 Each element from the hand-painted table, elephant motif, and tasseled seating conjured up a wistful memory of an exotic trip. The outdoor trimmings — fringes, tassels and braids — really showcased how far performance fabrications have evolved. 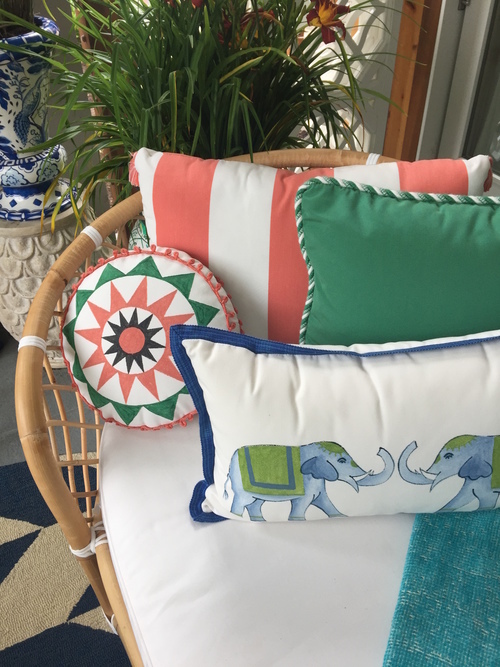 Hyde Park sofa | Elephant Gem Bliss pillow | Bacchus hand-painted Table | Benidorm plate setting by Frontgate. Jason and John curated their space like the jet-setters they are. What delight to have this exotic setting out your backdoor to enjoy daily! St. James Dining Chair embellished with tassel chair ties. The Technicolor cherry on top was the pool cabana by Cricket Burns. Cricket flexes her styling muscle in this space with color and verve, a great example of her home styling she dubs “Jushing.” She has amassed an inventory of furnishing that is on hand for quick décor transformations: Keep your eyes peeled for the Jushe-mobile that delivers her finds to your door. Her easy, in-and-out home styling service is a fast growing trend in decorating. May you be enjoying the wonderful sunny traditions you share with your family. I’m off for vacation with mine, so I can power-up in September. I have lots of projects percolating, including some upcoming speaking engagements and a workshop, click here for details. Let’s hope for an Indian Summer!